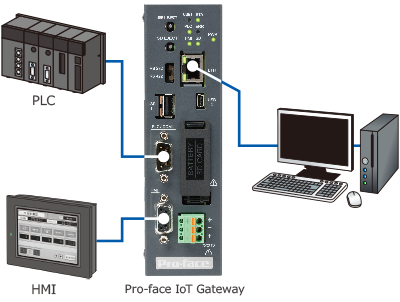 The new Pro-face IoT Gateway, GP4G01, relays data communication between the HMI and the PLC. No ports and no program changes are required, and it retains communication of the connected devices even when Pro-face IoT Gateway is powered off. Connect without serial communication I/F available. Relay data between the HMI and PLC communication with existing connection. Connect without changing programs of HMI and PLC. Change Pro-face IoT Gateway settings on a Web browser after installation. Save data in a SD card as a CSV file. Transfer data to a PC using the FTP client feature. Share collected data with database. Collect data in a wide variety of forms including Excel. * Data Management Software Pro-Server EX is required.